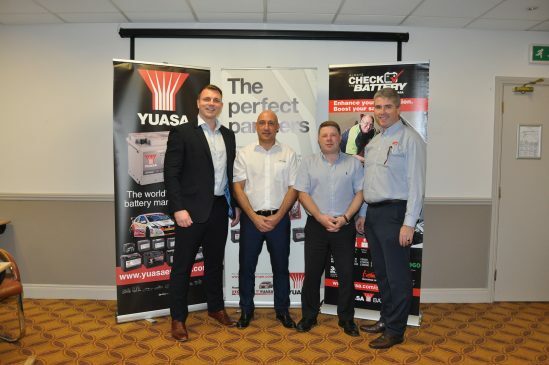 GS Yuasa Battery Sales UK Ltd are rounding off their most successful year of training ever, following an action-packed programme of educational events across the UK and Europe. During 2018, so far, GS Yuasa has delivered over 50 dedicated training events to thousands of automotive professionals, including a recent week-long training tour of Ireland. The battery manufacturer has also provided training at various trade shows and support events. Industry-leading training is an integral part of GS Yuasa’s award-winning products and services. Aiming to dispel myths and highlight opportunities, sessions deliver up-to-date training on the latest battery technology in an engaging and accessible way. They are tailored to suit the customer’s requirements and can be pitched for specific job roles, from workshop technicians to customer services. Yuasa cover all areas of industry best practice, from fitting the correct specification battery to maintaining stock correctly. As well as offering technical guidance, their professional training sessions include real-life, useful product demonstrations. This includes how to make the most of their powerful Yuasa Online Battery Lookup fit.yuasa.com; as well as the Yu-Fit Battery Configurator tool to reprogram the Battery Management System (BMS) when the battery has been replaced. GS Yuasa delivers training across all its sales territories, including Scandinavia, the Baltics and the CIS region. Large events this year have included training sessions for leading motor factors and stock assessment programmes for National retailers. In 2018, Yuasa also reached young engineering minds with training sessions held at colleges nationwide, including Petroc College in Barnstaple, Reaseheath College in Nantwich and the Swindon UTC. During October, Yuasa delivered a training tour of Ireland in conjunction with Somora Motor Parts. The highly successful week-long event included regional presentations in Dublin, Cork, Galway and Monaghan. Training focussed on AGM and EFB Start-Stop battery technology, its background, and the ever-increasing demands of new generation vehicles. Yuasa offers training services to all its customers and is currently developing the GS Yuasa Academy – a revolutionary online training platform which will be launched in 2019.